I get asked certain questions all the time. Tim, how do you do such-and-such on a PC? Tim, how can I do so-and-so on my tablet? Tim, why are you so devilishly handsome? It’s often the same questions over and over again – not surprising really as many people want to do much the same things with their devices. After all, unless you can get PCs, laptops, phones and tablets to do what you want, they’re just expensive doorstops. A few years ago, people only wanted to do these things with PCs or laptops – not many people had smartphones or tablets… after all, not that long ago they didn’t even exist. Back then (in 2007) I wrote two books called “Next Steps on your PC” – all about the things people asked me how to do on their PC. They were hugely popular – but they’re out of print now. And they only covered doing these things on PCs. But then tablets and smartphones came along and you can do all sorts of things on them. Not only that, you can do more on a PC or laptop than you could back then… and not only that but it’s often even easier than it was back then – once you know how. Using all these devices can be confusing unless someone has shown you exactly how to do it… it can be hard to make sense of it… and sometimes you don’t even know what you can do with the device! Not to mention that it can be nigh-on impossible to work out how to get it to do even things that you know it can do – there are often no buttons on the screen or anything to make it obvious. You have to already know about certain apps or know when to swipe off the side of the screen or whatever. That’s where these books come in: They’re a sort of all new version of the books I mentioned before, and this time not just for PCs, but for tablets and phones as well. Next Steps on your PC, Laptop, Tablet or Smartphone. They show you how to do the things most people want to do with their devices, not just how to operate the device itself. Everything is explained nice and simply, step by step, in plain simple language. There’s no jargon – except where I explain what it means in case you come across it somewhere else. There are lots of pictures of the screen, showing you where to click, tap or swipe and it tells you exactly what you need to do. On a PC, this trick will often let me help people even when they’re stuck in a program I’ve never seen before in my life! Page 6 (page 7 has the equivalent for tablets and smartphones). If you’ve ever had a “junk call” you might be glad to read page 37, whether you have a smartphone or not. People talk about “The Cloud” – and 9 out of 10 of them couldn’t even tell you what it is. (I have a sneaking suspicion some of the others would get it wrong, too). Here’s a nice, simple explanation that makes sense. Page 1. It also explains the 4 reasons why you might want to actually use it. Printing labels – whether you want a whole page of identical labels (eg with your new address on when you move) or lots of different ones (maybe for Christmas cards). The special trick on page 57 that makes all sorts of documents easier to do a good job of. That’s not all, of course. There are lots of other useful things – the things people have often asked me how to do… the things most people want to be able to do with their PCs, laptops, tablets and smartphones… whichever they have. But don’t be put off by how much there is – you don’t have to use all of it. Have a look, pick the bits that are relevant to you and ignore any things you’re not interested in, for now at least. You can always come back later on if you are interested in them then. It’s all explained nice and simply, in plain language with plenty of pictures of the screen to show you exactly what to do. Who are the books suitable for? You’re not a tech expert – these books are written for “ordinary” people, not techies. You’re not an absolute complete beginner – you should already know how to use a mouse if you have a PC and how to tap on the screen if you use a tablet or smartphone. 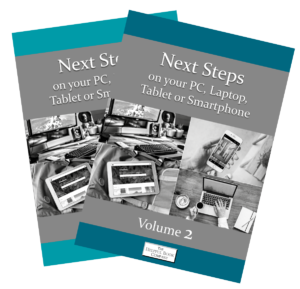 If you’ve got that figured out, you should be fine (if you haven’t, have a look at our “One Step at a Time” range which covers all the absolute basics for PCs, tablets and phones). So how much are the books? These devices you’re using can be really expensive. Even the cheaper iPads tend to be £300 or so – and you can pay an awful lot more. But you might not be getting all you could out of it – half of what it could do for you might be being wasted! These books can help with that and they won’t cost anything like as much as the tablet, phone or PC did. Each book is just £12.97 and there’s only one lot of P&P of £2.99, no matter how many books you order. I have just sent the books off to be printed (as of Friday 18th). It usually takes about two weeks to get them in stock. But you can order now and you’ll get one of the very first, hot off the press, the moment they arrive in stock. Update: now in stock – order now and we’ll post it straight out to you. Order a free trial set now and you don’t have to pay a penny until you’ve got the books and decided you’re happy with them. Otherwise send them back to us and owe nothing. Just click here or call 01229 777606 if you’d prefer to talk to Emma, Jade or Michelle to order your copy. We’ll pop it in the post to you straight away – you don’t have to pay anything until you’ve got your books and are happy with them. PS Of course, you don’t have to try all 71 things – at least not for now. Pick the ones you’re most interested in to start with and you can always come back to the others later on… Why not get your copies of the new books ordered now, so you can have a look?